You’ll awaken refreshed after a restful night in one of our seven beautiful guest rooms, all opening to decks and terraces overlooking the New River. Huge, wraparound decks provide plenty of space to enjoy the panoramic views, bird watch and even spot a deer or two in the lower meadow. It’s the perfect place to escape the rigors of work or to celebrate a special occasion! We are the perfect place for small, intimate weddings or even group gatherings. So think of a good reason to relax and be pampered, check our availability, and send us your requests. We look forward to meeting you! Our luxury rooms are complete with king or queen beds, private baths, whirlpool or soaking tubs, satellite TV and DVD players, clock radios with CD/MP3 connections, and free wireless internet. In the morning, enjoy a full breakfast in the dining room or on the deck. Specialties include fresh vegtable frittata, cinnamon raisin french toast, gingerbread pancakes with fruit compote and home baked breads, fresh fruit, juice, coffee and tea. Evening amentities include Jeanne's fresh baked cookies and pretzles. 25 Minutes from Virginia Tech, just off 460. Relax and enjoy a massage for one or two with our massage therapist in the privacy of your room or on our deck with privacy screens. Swedish, deep tissue, prenatal,pre/post sporting events. Includes an assortment of cheeses, crackers, nuts and decadent chocolates. 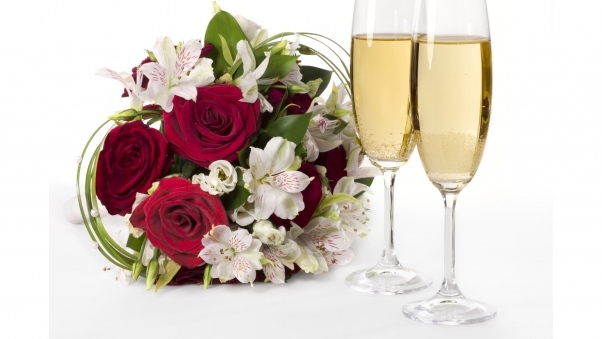 Suprise your loved one with a bottel of champagne, chocolate dipped strawberries, and bouquet of fresh flowers. Perfect for birthday, honeymoon, anniversary, or "babymoon". Riverbend Basket filled with an assortment of cheeses, crackers, nuts, and decadent chocolates. 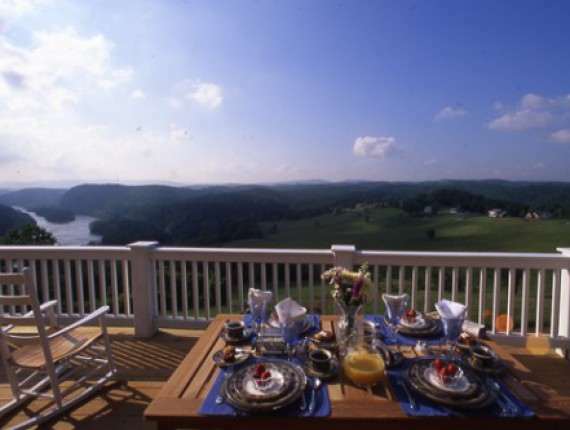 A guided tour from the Inn at Riverbend to 2 wineries located off the Blue Ridge Parkway. Visit Villa Appalaccia Winery and Chateau Morrisette. Includes : Virginia Winery map, all transporation to and from Inn at Riverbend, fuel charges, wine tasting fees, lunch, and chilled beverages. Available Friday-Sunday with 72 hour notice. Call the Inn to book! Package Cancellation Policy : Deposit will be refunded if cancellations are received in writing 10 days prior to tour date.
! !This package is best done with reservations for 3 nights!! Cascade Falls is one of the most beatiful waterfalls in Virignia. The 69ft falls crash into a large wading pool surrounded by 200 foot cliff walls. The area features several shady picturesque picnic spots, secluded native trout streams and the 4-mile scenic hike that loops to the falls and back. $3 provided for parking fee. Bring your own mountain or hybrid bicycle or we can reserve one for you to pick up at Draper Mercantile. Spend your time biking this 57mile trail that takes you through 2 tunnels, 3 major bridges and 30 smaller bridges/tresties. A lunch certificate will be provided for The Blue Door in Draper Mercantile and Trading Company. Pick one, pick two, pick all four. Relax while you float 37 miles of the New River which flows through the heart of Giles County. The soothing river provides scene after scene around every bend that is beyond your imagination. We will set you up with our local outfitter for your water activties so all you have to do is be ready for fun!